Ryan O’Halloran reports, the Jacksonville Jaguars have named quarterback Chad Henne the starter for their third preseason game against the Carolina Panthers. This news comes on the heels of yet another poor performance by Blake Bortles. After struggling most of last season and earning the 27th highest quarterback grade of 69.2, Bortles entered the preseason needing to improve quickly. 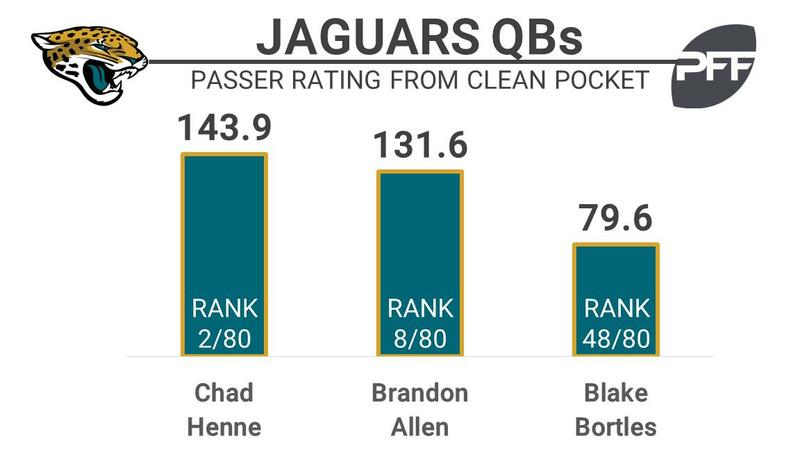 Throughout the first two preseason games both backup Chad Henne and third-string quarterback Brandon Allen have performed better than Bortles. In their second preseason game Allen, competing against second and third-team defenses, earned the highest quarterback grade among the trio at 83.2 overall and Henne was solid earning a 72.6 overall, compared to Bortles who graded poorly earning a 52.7 grade. Through two preseason games Henne ranks second among 80 qualifying quarterbacks in adjusted completion percentage at 87.5 percent and also ranks second in passer rating from a clean pocket at 143.9.